1. You can often predict what tough questions your prospect will ask. You have already done your homework, surveyed your community, and interviewed a few people in the audience.I can only imagine how many focus groups and rehearsals our Presidental candidates completed for these three scheduled debates. 2. The audience is already predisposed towards a single competitor. You may not like it, but it is human nature. 3. Much hoopla and pomp surrounds the date of the big pitch…yet, by the time it arrives, the choice has already been made. 4. Most contenders bombard the prospective client with too much data and seldom tell memorable stories. The first 45 minutes of last night’s debate was a predictable rehash of statistics that each candidate has been using throughout their campaign. 5. The meeting moderator sets the tone for the entire meeting. She ensures that participants pay respect to the presenters, and remain quiet to allow time for them to present their positions. Moderator Jim Lehrer did a fine job of setting the stage for Obama and Romney to speak without interruption and distraction. Are you in control of the meeting, or are you at the mercy of the prospect? 6. Winning presenters and debaters will limit their key points to three or fewer. Mitt Romney listed five. I doubt any of us will remember them once the debates have ended. 7. Participants remember pithy sound bites. Romney used the term “trickle down government” to criticize Obama’s job creation strategy. 8. Debates seem to favor tactical discussion. They set a dangerous precedent by assuming that each competitor/candidate has an underlying vision for the future. 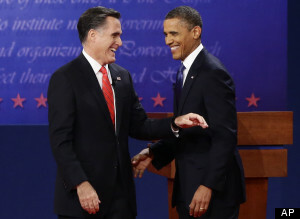 After listening to hours of debate and campaign sound bites, I still do not know Romney’s nor the president’s vision for America. In today’s business environment, corporate buyers want to invest in relationships with firms who create a compelling vision of the future. 9. Human metronomes win every time. Lehrer lost control of the debate last evening when he allowed Obama and Romney to exceed their allotted time by 6 minutes. This is a surefire way to lose your audience. I certainly caught myself drifting. 10. “Is this program so critical that we need to borrow money from China to pay for it?” If elected, Mitt Romney intends to use this question for determining which government programs stay or go. Before you even step foot into that presentation room, your filter for winning the right accounts needs to be as headstrong and blunt as that question. Keep the option open that you may need to walk from the opportunity. Today, it’s essential for B2B marketing and sales teams to master the art of improvisation, debate, and story telling. Otherwise, your company comes across as a bunch of empty suits. Copyright 2012, Lisa Nirell. All rights reserved.Photo courtesy of Getty Images.